The Almeida Theatre is one of the most exciting theatre companies in the UK, presenting some of the finest international classical and contemporary work in the country. The theatre, a refurbished Grade II listed building in the heart of Islington, London possesses a very particular quality that arguably makes it unique in the ecology of London theatre, combining a sense of the epic within a liberatingly intimate setting. Its reputation for artistic excellence has thrived in recent years, with an eclectic programme of enlightening revivals, new writing and commissioned translations. 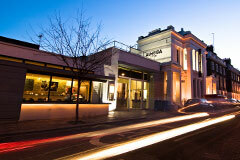 The Almeida Theatre presents up to six productions and a Summer Festival each year. The theatre undertakes a regular programme of captioned, audio described and British Sign Language performances. Almeida Projects, a full–time programme of work with schools, young people and the local community, is also an integral element of the theatre’s activities.